Whitsundays diving liveaboard and Airlie Beach diving liveaboard, Kiana, sails to Bait Reef on the outer Great Barrier Reef as part of their 3 day 2 night liveaboard scuba diving trip. Scuba diving is optional on this Whitsundays diving trip. 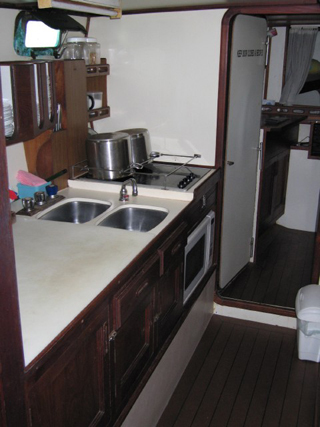 Kiana is 50 ft ketch that combines sailing, scuba diving and snorkelling with visits to Whitehaven Beach and other Whitsunday Islands. 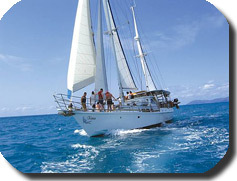 The Airlie Beach Great barrier Reef diving liveaboard provides certified scuba divers with enough time for up to 4 dives. Introductory dives are also included for those who are uncertified but who would like to experience the thrill of scuba diving. See our full Australia scuba diving trips selection here and see Getting to Airlie Beach for transport tips. Whitsundays diving liveaboard and Airlie Beach diving liveaboard, Kiana, sails to Bait Reef on the outer Great Barrier Reef as part of their 3 day 2 night cruise. Scuba diving is optional on this Whitsundays diving trip. Kiana is 50 ft ketch that combines sailing, scuba diving and snorkelling with visits to Whitehaven Beach and other Whitsunday Islands. The Airlie Beach Great barrier Reef diving liveaboard provides certified scuba divers with enough time for up to 4 dives. Introductory dives are also included for those who are uncertified but who would like to experience the thrill of scuba diving. 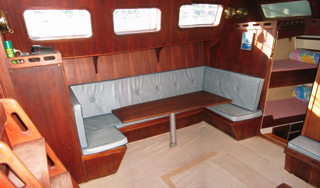 The interior teak finish of this Whitsundays Great Barrier Reef diving liveaboard is traditional and quite beautiful. It exudes a warm luxurious feel and is heavily booked throughout the year often with returning guests. 20% deposit required on making your booking. Balance is payable when checking in at the Airlie Beach Office. Please complete the email Booking Enquiry form below or give us a call on 07 4946 1067 to check availability for the Whitsundays 3 day 2 night dive liveaboard trip. 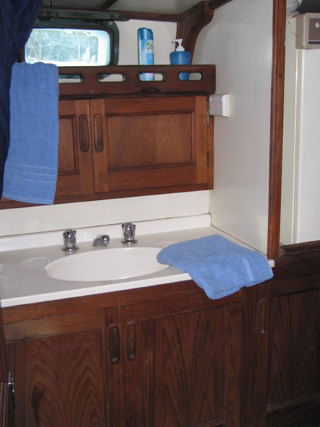 These photographs will give you some idea of the craftman like timber interior of this well appointed vessel. From Airlie Beach Monday and Friday morning from the Abel Point Marina at 8:00 am. Check in at Airlie Beach booking office before 7:00pm the night before departure. Rates include all Government taxes, fuel levy, stinger suit hire, bed linen, snorkeling equipment, meals. scuba dive equipment and wetsuit is included. Once your enquiry has been received we will confirm whether places are available on the dates that you have chosen. You will then receive directions for payment of a deposit to secure your place on the cruise. The balance owing is paid when you arrive on board.